If you’re looking to cater your next meeting or party, you’re in the right place. For groups from eight to 100,000+, we have healthy and delicious choices for breakfast, lunch and all-day meals. Learn more about our crowd-pleasing catering services, or place your order today. (10610 cal) Mini Tuscan Focaccia Sandwiches / Meatballs in Marinara / Italian Pasta Salad / Brownie Duo - fudge-walnut plus peanut butter brownies. (9930 cal) Cold, mini sandwiches on potato slider buns: 12 Roasted Turkey & 12 Ham-Salami, with provolone, shredded lettuce and Roma tomato / American Potato Salad / 12 pickles / 6 chocolate chip & 6 sugar cookies. (8210 cal​) Featuring assorted petite sandwiches - veggie cream cheese & cucumber, with two of our most popular family recipes: chicken salad with almonds & pineapple, and tuna salad made with eggs - on country white & multigrain wheat / Fresh Fruit & Cheese Tray with creamy fruit dip / Decadent Dessert Bites. (11370 cal) Hot, mini sandwiches on potato slider buns: 12 Reubens with corned beef, Swiss, Thousand Island dressing & sauerkraut on the side / 12 Rachels with roasted turkey, pastrami, Swiss, Thousand Island dressing & homemade coleslaw on the side / American Potato Salad / 12 pickles / 6 chocolate chip & 6 sugar cookies. (15240 cal) Sliced pepperoni & hard salami / cubed pepper jack & cheddar / kalamata & queen stuffed green olives / fire-roasted piquillo peppers / artichoke hearts / basil pesto aioli / our popular garlic toasties & flatbread / Brownie Duo - fudge-walnut plus peanut butter brownies. (4990 cal) Two dozen hot roast beef mini sandwiches with provolone & mayo on potato slider buns. Served with au jus on the side. Serves 12. (130-160 cal per mini sandwich) Roasted turkey breast, roasted tomatoes, fresh basil pesto, mayo and Asiago mini sandwiches are paired with smoked turkey breast, chipotle aioli, bacon, organic spinach and provolone mini sandwiches, toasted on herb focaccia bread. Seasonal fresh fruit including select organics, assorted cubed cheese and fresh-made creamy fruit dip. (11140 cal) Party-perfect sliced pepperoni & hard salami / cubed pepper jack & cheddar / kalamata & queen stuffed green olives / fire-roasted piquillo peppers / artichoke hearts / basil pesto aioli / our popular garlic toasties & flatbread. Seasonal fresh fruit including select organics arranged for a perfect centerpiece. Served with fresh-made creamy fruit dip. (4100 cal) Delectable edibles, featuring 20 unbeatable brownies: 10 fudge-nut brownies & 10 peanut butter brownies. Garden fresh veggies including select organics served with fresh-made ranch dressing. (240-380 cal per person) Flatbread sandwiches featuring fresh-cracked eggs and melted Muenster. Includes an assortment of nitrite-free ham, breakfast sausage, crispy bacon and vegetarian options. (170-200 cal per person) Help yourself to creamy vanilla yogurt and mix in granola, strawberries, grapes and organic apples! Fresh fruit including select organics can be added to any of our breakfast trays or ordered by itself. Served with our fresh-made creamy fruit dip. (340-430 cal per slice) Cinnamon walnut, New England blueberry and cranberry, and seasonal coffee cakes, sliced and arranged on a tray. Serves 8 or more people. (350-440 cal per person) A scrumptious new mix of assorted pastries, coffee cakes and breakfast bars. Includes cups, sweetener and creamer. (520-630 cal per person) Your choice of premium sliced ham, breakfast sausage or crispy bacon with scrambled eggs and melted cheddar, served on all-butter croissants and organic ancient grain buns. Vegetarian Veggie Scramble Wraps available. (510-620 cal​ per person) Southwest Wraps featuring our fresh-made pico de gallo, scrambled eggs, cheese and your choice of breakfast meats, paired with Vegetarian Veggie Scramble Wraps, all on organic wheat wraps. Served with fresh-made salsa. (800-1310 cal) Your Meat Choice, leafy lettuce, tomato, Deluxe Bread Choice and assorted cheeses. Chips, pickle, Dessert Choice. Vegetarian option available! (870-1190 cal) Roasted turkey breast, fresh-made guacamole, Roma tomatoes and organic field greens in an organic wheat wrap. Served with a side of fresh-made ranch dressing. Fresh fruit or baked chips, and Dessert Choice. (860-1660 cal) Our Deluxe Box plus one side: fresh fruit or Italian Pasta Salad. Vegetarian option available! (680-980 cal) Your Meat Choice, leafy lettuce, tomato on gluten-free bread. Served with chips, pickle and an Udi's Snickerdoodle Cookie. (750-1280 cal) Your Meat Choice, leafy lettuce, tomato and Traditional Bread Choice. Chips, pickle, Dessert Choice. (700-1020 cal) Organic wheat wrap filled with organic spinach, fresh-made guacamole and pico de gallo, mushrooms and Asiago. Served with a side of fresh-made salsa. Fresh fruit or baked chips, and Dessert Choice. (680-1060 cal) Half-portion of your Meat Choice, leafy lettuce, tomato on your choice of Deluxe breads. Chips, pickle, Dessert Choice. (570 cal) Organic spinach, cucumbers, zucchini and our homemade veggie cream cheese mix with red bell pepper, green onions, garlic and Asiago, in an organic wheat wrap. (1030-1220 cal) Premium ham, roasted turkey breast, bacon, cheddar, Swiss, leafy lettuce and tomato on an all-butter croissant. Chips, pickle, Dessert Choice. (70-440 cal) All are nitrite-free. (1410-1580 cal) Premium ham, roasted turkey breast, bacon, cheddar, Swiss, leafy lettuce and tomato on multigrain wheat. Chips, pickle, Dessert Choice. (900-1140 cal) Roasted turkey breast, fresh-made guacamole, tomato, organic field greens, bacon and Swiss on an all-butter croissant. Fresh fruit or baked chips, and Dessert Choice. (1250-1420 cal) Grilled, 100% antibiotic-free chicken breast (chilled), tops mixed salad greens, grape tomatoes, avocado, cheddar, Asiago and bacon with fresh-made ranch dressing. Includes Dessert Choice. (1150-1320 cal) Fresh romaine, Asiago, croutons and creamy Caesar dressing. Topped with grilled, 100% antibiotic-free chicken breast (chilled). Boxed with toasted herb focaccia bread. Includes Dessert Choice. (1010-1180 cal) Organic field greens, grapes, grilled, 100% antibiotic-free chicken breast (chilled), feta, nuts, dried cranberries, pumpkin seeds, organic apples and raisins with balsamic vinaigrette. Includes Dessert Choice. (1090-1260 cal) Grilled, 100% antibiotic-free chicken breast with mixed salad greens, cheddar, grape tomatoes, chopped avocado, and our roasted corn and black bean mix with fresh-made jalapeño ranch dressing. Includes Dessert Choice. (1140-1310 cal) Premium ham, roasted turkey breast, Asiago, cheddar, grape tomatoes, kalamata olives and hard-boiled egg slices on mixed salad greens with fresh-made ranch dressing. Includes Dessert Choice. For 8 or more people. Includes two deliveries (Breakfast & Lunch) with only a single delivery charge. Calorie counts for our package components are listed separately on their category pages of this guide. For 8 or more people. (1100-1690 cal per person) Deluxe Sandwich Tray, Fresh Fruit Tray, one salad choice: Roasted Corn & Black Bean Salad, Italian Pasta Salad or American Potato Salad, Assorted Dessert Tray, chips or baked chips, and pickles. Traditional Sandwich Tray, one salad choice: Italian Pasta Salad or American Potato Salad, Assorted Dessert Tray, chips or baked chips, and pickles. (1280-2090 cal per person) Plain Jane® Potato Bar, Fresh Side Salad Tray or Side Caesar Salad Tray, and Assorted Dessert Tray. Additional cost associated: Grilled, 100% Antibiotic-Free Chicken Breast, Chili, Southwest Chicken Chili or Broccoli Cheese Soup. 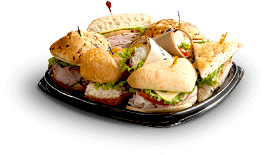 Sandwich tray of 10 lighter-portion deluxe sandwiches (20 half-sandwiches), choice of salad tray, Assorted Dessert Tray, individual bags of chips and pickles. Serves 10. (1200-1680 cal per person) Cool Wrap Tray or Hot Wrap Tray, Fresh Fruit Tray, Assorted Dessert Tray, blue corn chips and fresh-made salsa. (1370-1670 cal per person) Your choice of one Hot Pasta, one Side House Salad Tray or Side Caesar Salad Tray, and Assorted Dessert Tray. Served with toasted herb focaccia bread (220 cal). (870-1650 cal per person) Deluxe Sandwich Tray, Fresh Fruit Tray, Decadent Dessert Bites, chips or baked chips and pickles. Our serving size is based on two halves per person. (510-1060 cal per person) Assorted premium meats, tuna salad with egg, and famous chicken salad with pineapple and almonds, with cheeses, leafy lettuce and tomatoes on our deluxe breads, buns and wraps. Cut in halves, with mayo and mustard on the side, chips or baked chips, and pickles. (450-970 cal per person) Assorted premium meats, tuna salad with egg, and famous chicken salad with pineapple and almonds, with leafy lettuce and tomatoes on multigrain wheat, country white and rye breads. Cut in halves, with mayo and mustard on the side, chips or baked chips, and pickles. (710-860 cal per person) A really cool combination tray featuring Chicken Salad with almonds and pineapple, Mediterranean, Spinach Veggie and Turkey wraps, in organic wheat wraps. Cut in halves, with blue corn chips and fresh-made salsa. (850-1050 cal per person) A combination tray of Smokey Jack Panini, Chicken Panini and Ranchero wraps, in organic wheat wraps. Cut in halves, with blue corn chips and fresh-made salsa. (670-790 cal per person) Roasted turkey breast, roasted tomatoes, fresh basil pesto, mayo and Asiago sandwiches are paired with smoked turkey breast, chipotle aioli, bacon, organic spinach and provolone sandwiches, toasted on herb focaccia bread. Cut in halves, with chips or baked chips and pickles. A collection of "biggest hits" from our Deli Menu: California Club, Club Royale, Shelley's Deli Chick on an organic Ancient Grain Bun and Amy's Turkey-O on an organic Ancient Grain Bun. Cut in halves, wth chips or baked chips, and pickles. *Our Chicken Salad contains almonds and Tuna Salad contains eggs. For 8 or more people. Each served with toasted herb focaccia bread (220 cal). (1370-1670 cal per person) Your choice of one Hot Pasta, one Side House Salad Tray or Side Caesar Salad Tray, with Assorted Dessert Tray. (760 cal per person) Penne pasta topped with creamy Alfredo sauce, grilled, 100% antibiotic-free chicken breast and Asiago. (690 cal per person) Penne pasta topped with tomato-basil sauce, grilled, 100% antibiotic-free chicken breast and Asiago. (700 cal per person) Bowtie pasta topped with roasted zucchini, our fresco mix and Asiago. (720 cal per person) Penne pasta topped with Italian red sauce, meatballs and Asiago. (490-1000 cal per person) Giant baked potatoes wrapped hot and ready to serve. Toppings: cheese, sour cream, bacon, butter and chopped green onions. (110-180 cal per person) Grilled,100% Antibiotic-Free Chicken Breast, Chili, Southwest Chicken Chili or Broccoli Cheese Soup. (610 cal per person, 460 cal without chicken) Grilled, 100% antibiotic-free chicken breast, mixed salad greens, grape tomatoes, avocados, cheddar, Asiago, bacon, with fresh-made ranch dressing. (540 cal per person, 390 cal without chicken) Grilled, 100% antibiotic-free chicken breast with romaine, Asiago, croutons and creamy Caesar dressing, served with herb focaccia bread. (620 cal per person, 470 cal without chicken) Organic field greens, grapes, grilled, 100% antibiotic-free chicken breast, nuts, dried cranberries, pumpkin seeds, organic apples, raisins and feta with balsamic vinaigrette. (500 cal per person) Grilled, 100% antibiotic-free chicken breast, mixed salad greens, grape tomatoes, our roasted corn and black bean mix, cheddar and chopped avocados with fresh-made jalapeño ranch dressing. (470 cal per person) Premium ham, roasted turkey breast, Asiago, cheddar, grape tomatoes, kalamata olives and hard-boiled eggs on mixed salad greens with fresh-made ranch dressing. (310 cal per person) Mixed salad greens tossed with garden-fresh veggies, cheese and croutons. Served with fresh-made ranch dressing. (160 cal per person) Freshly tossed, without chicken. (200 cal per person) Freshly tossed, without chicken, served with herb focaccia bread. (450-670 cal per person) Luscious layers of moist pound cake, real whipped cream and fresh strawberries. (450-540 cal per person) An assortment of fresh-baked cookies and fudge-nut brownies. (240-330 cal per person) Filled with 12 fresh-baked cookies of assorted flavors. (80-130 cal per Bite) A delightful assortment of bite-sized dessert bars. (130-160 cal per Bite) New dessert and special gift: chocolate, vanilla and red velvet cake bites coated with icing and topped with sprinkles, nestled in a tray. (4100 cal) Delectable edibles, feauturing unbeatable brownies: 10 fudge-nut brownies and 10 peanut butter brownies. Served with cups, sweetener and creamer. iced teas; cups, straws and ice for lemonade. Gluten-free sandwich bread is available on many of our sandwich trays for an extra charge. Ask about it! Vegetarian options are available on all of our sandwich trays. Ask about them!